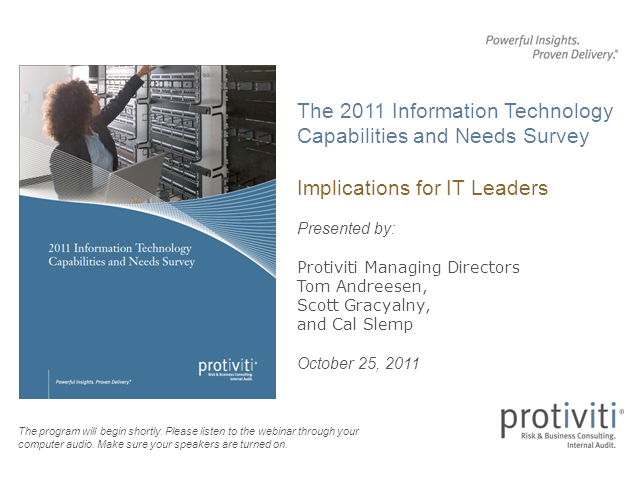 We will review the results of Protiviti’s 2011 Information Technology Capabilities and Needs Survey. Analysis of the survey results, based on the input of more than 200 respondents – including CIOs, CTOs, and CSOs – will help organizations assess skill levels and identify those competencies in most need of improvement. We will highlight a number of key trends and priorities CIOs and their organizations are addressing. These include IT security and privacy, virtualization and cloud computing, social media, regulatory compliance, data classification and management, and managing contractors and vendors. CPE credits will be offered. Webinar attendees will receive a complimentary copy of the complete report.